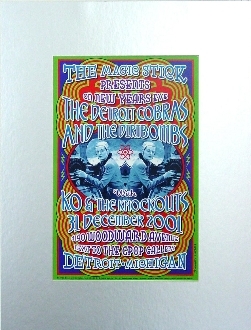 Custom single matted(silver) Detroit Cobras/Dirtbombs New Years Eve poster from The Magic Stick, 2001. Archival/acid free mat, foamboard and mylar corner mounted components. Secure and frame ready. Matted poster(dlk016) measures 18x24 and comes in a poly sleeve. Designed and signed by Dennis Loren in black sharpie. I think Buck Rogers is smiling. Ships flat.